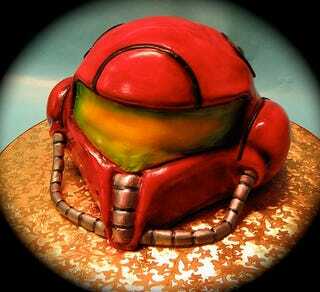 Reader cybershark pointed us to that gamecake, described as "a stunning groom's cake in the shape of Samus Aran's head." Please, say helmet. Otherwise we're going all John-the-Baptist on dessert here. It also sounds like it's about a billion calories per serving, with scads of fondant and 100 percent pure lard icing (I kid. It's buttercream, which is close enough). Its creator was contacted and she described its construction. The cake was a mint chip cake hand carved from round cakes, stacked, and iced in buttercream and then covered in fondant. The metallic parts were made of belgian modelling chocolate and painted with silver highlighter dust. The entire cake was airbrushed to add color and dimension to the metallic parts as well. The cake was a surprise for the Groom, he and the bride are huge fans of the game. Also, here is an image of a sugar-cookie mosaic of a (literal) Metroid that some of you spotted and sent along too.